Plupload is a component that makes it easy to upload files through a web browser. When you add Plupload to a web page, users can select multiple files to upload and users can see the progress while an upload is taking place. To read more about Plupload see http://www.plupload.com/. Plupload can be configured to upload files to Amazon S3. 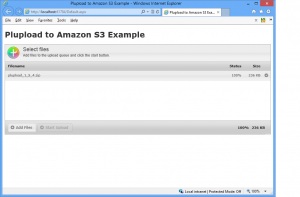 The following article describes how to create an ASP.NET web page which uploads files to S3 using Plupload. Make sure the crossdomain.xml file has public permission on S3 after you upload it. The crossdomain.xml file will allow Flash, which Plupload uses, to interact with your bucket. The sample project contains the Plupload files and an ASP.NET page which hosts Plupload. The ASP.NET web page is displayed below. //order for this example to work. You must make this file public (everyone view permission). When using the code enter your values for AWSAccessKeyID, AWSSecretAccessKey, and BucketName. The code starts by creating a policy document. The policy document describes what is allowed to be uploaded. Read more about policy documents at http://docs.amazonwebservices.com/AmazonS3/latest/dev/HTTPPOSTForms.html. Next the code creates a hash of the policy document using your AWSSecretAccessKey. Both the hash and the policy document are uploaded to Amazon. Amazon knows the policy document is from you since only you can create the correct hash. Next the code sets references to the required jQuery and Plupload files. Next the code created an instance of Plupload and sets it’s parameters. Here we use the values of the BucketName, AWSAccessKeyID, policy document, and policy document hash. When the code is run the Plupload window is displayed and the user can select files to upload. When the start upload button is clicked, the files will be uploaded to the bucket specified in the code.